UPDATE: Later in the day Suzyj87 admitted that the tattoos were not permanent. How much do you like your Facebook friends? Enough to have an inked needle daggered into you thousands of times, over and over again, until their faces are permanently etched into your flesh? Apparently some people do love their social network buddies that much--or, at least, are hungry for the tech blog attention that goes along with doing something silly related to Facebook, such as naming your first born "Like". 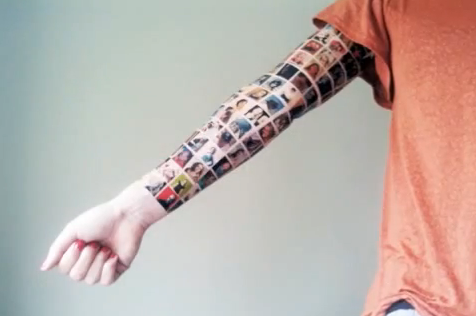 So it goes for YouTuber Suzyj87, who videoed the process of getting a sleeve tattoo of the photos of her 152 Facebook friends. "Of course I gave it a lot of thought. These are not all my friends. Just the people I care most about. I got their permission and they were very proud to be on it. To me it represents who I am right now and the time we live in. And of course I love the looks of it." Fair game--and it doesn't hurt that the patchwork style of her tattoo looks pretty good. 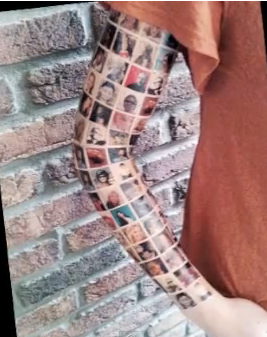 Good geek tats are rare, but they exist. But for every rad (to me, at least) BioShock tattoo, there are dozens of gut-wrenchingly awful Twilight tattoos out there--ones that are so terrible you want to scrape them off with your bare hands.